With the severe cold snap during the first two weeks of April, all of the flowers and trees are way behind schedule. The first iris finally bloomed yesterday and there are a lot more buds that will probably open within the next day or two. The flowers are really enjoying the warmer temperatures. It was 91 degrees today and we broke the previous record high which was 90! I think we skipped spring and went right into summer. I planted some impatiens yesterday. I always plant them on the east side of the house next to the hostas. They seem to do really well there because they get the morning sun which they prefer. I also plant some in the large planter on our front porch. I bought some other flowers too...pansies (my favorite), coleus, dianthis and geraniums. I need to stop by the nursery and buy a few more because I can never have too many flowers. Cardinal relief pitcher, Josh Hancock, died in a car accident early this morning. He was 29 years old. He was a key player in the 2006 World Series victory. He had pitched 3 innings in the game yesterday against the Cubs. Tonight's game against the Cubs has been canceled. Initial reports state that he was traveling west bound on highway 40 at Grand Avenue when he hit a tow truck which was parked in the far left-hand lane. The team will wear #32 on their sleeves for the remainder of the season in memory of Josh. Josh is the second Cardinal player to die within the last five years. In June of 2002, Darryl Kile died during a weekend series with the Cubs. Please keep Josh's family in your prayers. I made this card for my friend, Thelma. She's a little under the weather so I wanted to make a card to cheer her up. I recently purchased the Love Without End set and used it for the first time when I made this card. I've had the coordinating butterfly punch since last July and finally purchased the stamp set. 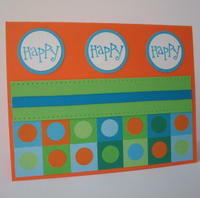 All card stock, ink, paper, accessories and images are @Stampin' Up. I used a piece of the designer paper from the Dots & Dashes line. 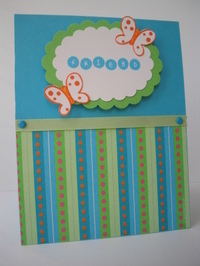 I originally stamped the butterfly in Pink Passion but decided I didn't really like it. The butterflies just didn't stand out so I chose Only Orange instead and I really liked the result. I added Dazzling Diamonds to the body of the butterflies for a little extra sparkle because you know how I feel about sparkle! I would have made a Bella card for Thelma but since I don't own any Bellas and since Thelma also is a Bella hater (welcome to the club), I figured she'd like this design better. We extended our cellular service contract on Wednesday and bought two new phones. My old phone was giving me fits. It didn't want to let me make calls and on the rare occasion when the call actually went through, the person on the other end could barely hear me. We each now have the new 3rd generation Motorola Razr...definitely a cool phone. It has a lot more features than we really need but I like it. Guess who's singing on my phone? Yep, it's none other than Captain & Tennille. I downloaded "Love Will Keep Us Together" as my ringtone. The last time I purchased a ringtone for my old phone (about 1 1/2 years ago), they didn't have any Captain & Tennille tunes available so I chose "Walk This Way" by Aerosmith and "Play That Funky Music" by Wild Cherry instead. I just might have to download the four other C&T ringtones that are currently available because, of course, you can never have too many Captain & Tennille songs. If you're a C&T fan, be sure to check it out. Oh my gosh...you just won't believe how silly some people are being about the little horrors called Bellas. They act like if you don't like these horrific stamps, you're not worthy of living, or at the very least, not worthy of participating on the stamping board. Hee hee hee...one stamper, who is a self-proclaimed stamping princess and who just happens to be the board moderator who removed my Bella post, even went so far as to post a long tirade on her blog saying something like this whole thing "saddens" her and that she needed to go do something "positive" and "kind." Sheesh. I want to thank all of the supporters who left comments or sent e-mails or private messages saying that they too hate the Bellas. Quite a few of them were afraid to post their opinion on the stamping board for fear of feeling the wrath of the "princess." One comment in particular is worth mentioning. A person named Emily left a message on my "I Hate the Bellas" post. Bill the anti-Bella fella posted a response. It's hilarious. Click here to read the entire post and all of the comments. Just in case you're wondering, I still hate the Bellas. I found a stamp set that I just HAVE to have (what's one more set when I already have almost 90 others...hee hee hee). It's called Fluffles the Cat. You can click here to view it and then click on the picture of the stamp set for a larger view. He's sooooo cute! I usually prefer wood mounted rubber stamps over acrylic but I just couldn't pass this up. As soon as I receive it and create a few cards, I'll be sure to post them. If you're wondering, I still hate the Bellas! I started the thread regarding these scary stamps (and yes, they are SCARY...I would post a link to show you but you might have nightmares) and the "powers that be" decided that we can't discuss anything negative. Actually, you can only discuss something negative if they agree with it. If they don't like it, they decide that the post doesn't "contribute positively to the community" and you then are banned from discussing it. Since I'm in the minority regarding these little horrors that they call Bellas, my thread got shut down. Hmmm, I thought we had freedom of speech. Apparently not! The beauty of having my own blog is I can say whatever I darn well please. So here goes...I hate the Bellas. They're ugly and they have maniacal grins which are really inverted triangles that they call a mouth. Their hair is wild and they have sticks for arms. There! I said it. OK, I'm done ranting. I feel better now! The latest ATC swap in which I'm participating is entitled "Glitter Window." You can view a great tutorial for Glitter Windows here. This technique involves using clear packing tape which is placed on the back of the card stock so that the sticky side shows through the window. Ultra fine glitter (I used Dazzling Diamonds) is then rubbed over the tape until it is no longer sticky. The result is a glittery window which showcases the focal image. Be sure to click on the photo for a larger view. All images, card stock, ink and accessories are @Stampin' Up. I really love the color combination of Taken With Teal, Apricot Appeal and Certainly Celery. Teal looks great with Cool Caribbean too. Actually, teal wasn't one of my favorite colors when I first bought the ink pads but I now seem to use it quite often. I've been using it so much lately that I'm going to have to order more card stock. Be sure to click on the links and check them out. I just tagged Julia (Too Crafty) . She was my "big sister" in the first Secret Sister round in which I participated. Have fun, Julia! I'm finally getting around to sharing my latest creations. It's definitely more difficult to photograph the card than to actually make the card in the first place, in my opinion. I'm still considering that new digital camera and I'm sure that would make the process easier (Bill, are you reading this?). That being said, all card stock, images, ink and accessories are @Stampin' Up unless otherwise noted. 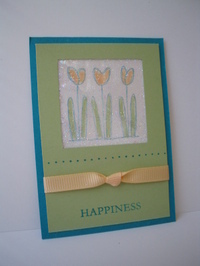 This first card is one of my newest creations using the designer series paper I received in my last Stampin' Up order. This particular set of paper is called Dots & Dashes. As I've said before, I don't normally use orange card stock but this paper just screams orange so I had no choice. This would make a cute card for a kid's birthday, don't you think? 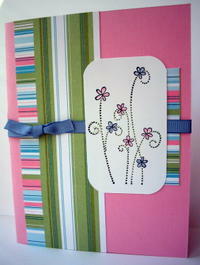 This second card uses the Polka Dots & Petals paper. Even though this paper is intended to coordinate with the Polka Dots & Petals and the Polka Dots & Paisley stamp sets, I ended up using one of the images from Simply Said stamp set instead. I just felt that this particular image seemed to be just right for this card. I have two other creations but I can't share them yet because I don't want the recipients to see them here on my blog before they receive the in the mail. I'll be sure to share them soon.